The Bolle AMP Goggle was developed to protect young children's eyes. The lens improves optical comfort and increases contrast. Ideal for long exposure to bright conditions. Engineered Flow-Tech venting systems in each frame promote directional airflow across the inside surface of the lens, reducing the potential for moisture build up and maintaining good vision. Double lens: Creation of a dual-pane thermal barrier between the cold dry outside air and the moisture generated by intense activity prevents distracting condensation from forming. P80+Anti-Fog: Embedded premium anti-fog layer in the inner lens disperses water molecules across the surface of the lens, restricting moisture build up that can impede your crystal clear view of the terrain ahead. It is suitable for 3 to 8 years children. It is available in white birds colour. 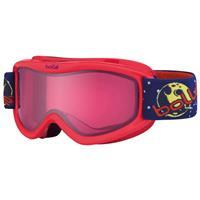 Perfect fit for young skiers and boarders !